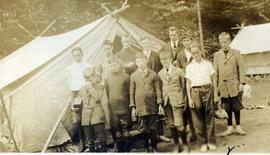 B&W print depicts a camp scene with unknown campers standing in front of a tent. "Y" is written on the lower right corner.Note: colour adjusted on jpg. Photograph depicts Ben with Steve Olsen on stage at the Variety Club's annual Christmas party for handicapped children. Written on the verso: Glenn Baglo photo. 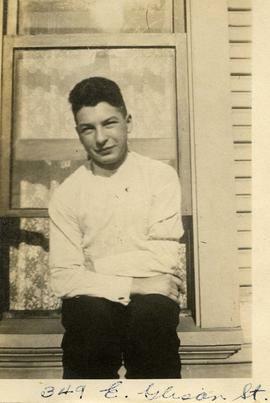 Photograph depicts Benjamin Sheftel constructing a sukkah.